Director – Travis Knight, Screenplay – Christina Hodson, Producers – Michael Bay, Tom DeSanto, Lorenzo di Bonaventura, Don Murphy & Mark Vahradian, Photography – Enrique Chediak, Music – Dario Marianelli, Visual Effects Supervisor – Jason Smith, Visual Effects – Industrial Light and Magic (Supervisors – Ivan Busquets & Samir Hoon, Animation Supervisors – Scott Benza, Marchand Jooste & Rick O’Connor), Special Effects Supervisor – Scott R. Fisher, Production Design – Sean Haworth. Production Company – Allspark Pictures/di Bonaventura Pictures/Tencent Pictures/Bay Films. On the planet Cybertron, the Autobots face defeat by the Decepticons. Optimus Prime orders an evacuation and sends B-127 to Earth to scout it for suitable relocation. B-127 lands in a military training camp in California where its’ arrival is witnessed by Agent Jack Burns. B-127 is then attacked by a pursuing Decepticon that destroys its voicebox and leaves it badly damaged. In the nearby town of Brighton Falls, Charlie Watson is about to turn eighteen and is still grieving over the death of her father. Desiring her own transport, she comes across a Volkswagen at her Uncle Hank’s junkyard and persuades him to give it to her. Back home in her garage, she is startled when the car transforms into B-127. She befriends it, nicknaming it Bumblebee and is able to install a radio to replace its voicebox so that it can communicate by playing songs. Her secret is discovered by neighbour Memo Gutierrez, However, her re-engineering of Bumblebee has activated a signal that has alerted two Decepticons who come to Earth determined to destroy it. They persuade the US military that their intentions are peaceful and to turn over defence networks to allow them to track Bumblebee down. Michael Bay’s series of films based on the Transformers line of toys and cartoon series – which consist of Transformers (2007), Transformers: Revenge of the Fallen (2009), Transformers: Dark of the Moon (2011), Transformers: Age of Extinction (2014) and Transformers: The Last Knight (2017) – have enjoyed massive box-office popularity. At the same time, all of the films have been critically slammed for their emphasis on special effects and orgies of mass destruction at the expense of plot or character. For the sixth film in the Transformers series, Michael Bay steps away from behind the camera for the first time. (He is still present as a producer). The director’s chair has been handed over to Travis Knight, a former animator at Laika, the special effects house that have been having great success in the last few years with their stop-motion animated films. Knight made his directorial debut with Laika’s Kubo and the Two Strings (2016). BumbleBee is a spinoff of the popular character of Bumblebee, which was one of the original Transformers toys. Bumblebee appeared in the animated tv series The Transformers (1984-7), although there it could talk unlike its cinematic counterpart. The BumbleBee film acts as a prequel to Bay’s Transformers films, being set in 1987 and telling of Bumblebee’s arrival on Earth, how it lost its voicebox and how Hailee Steinfeld rewired it so that it could express itself via popular songs and finally its transformation from the yellow Volkswagen Beetle it was in the animated series into the Camaro it became in Bay’s films. 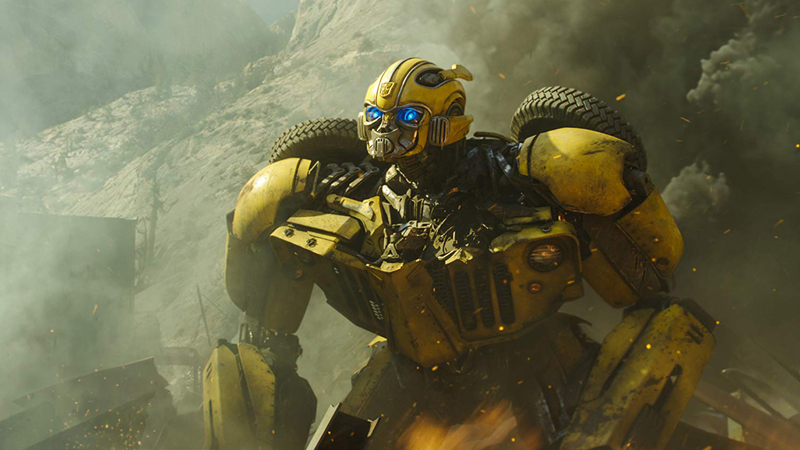 BumbleBee makes great contrast to Michael Bay’s Transformers films. Aside from one or two brief scenes at the start and at the climax, it is almost entirely free of the copious mass destruction that Bay loves to orchestrate and will often allow to drag on for in excess of twenty minutes at a time. It is the only one of the Transformers films that reigns in under a two-hour running time, for instance. With less of Bay’s bloat, it’s a gentler, quieter Transformers film. Perhaps the greatest contrast is a scene near the end where five vehicles are all about to crash where rather than a massive explosion and pile-up, Travis Knight ends the scene with them coming to a halt inches apart and one of them merely scraping the roof of the other as it rolls over the top. There has never been anything in Bay’s films with the sweet tenderness of the friendship we get between Hailee Steinfeld and Bumblebee, of moments like where the two hug or Bumblebee tries to brush sand from her hair. Bumblebee, even though a giant robot, is essentially a cute afraid child character not unlike E.T. or perhaps more so The Iron Giant (1999) or No 5 in Short Circuit (1986). Perhaps at most Knight shares in common with a Bay a certain sense of goofy humour – the scenes with Hailee Steinfeld and Jorge Ledenborg Jr. egging Grace Dzienny’s car that ends with Bumblebee entirely trashing the vehicle, or with Bumblebee causing chaos in the Watson family living room and kitchen. The best of these is a chase between Bumblebee and a cop that ends with Bumblebee scaling the walls of a tunnel and compacting Hailee and Jorge Ledenborg Jr. in its midst. Travis Knight also makes all he can of the 1980s setting. Bumblebee’s radio proves a great opportunity for a killer soundtrack of 80s pop tunes, while Hailee Steinfeld seems to sport a T-shirt for a different band of the era in every scene, while everywhere else is outfitted with posters and album covers of the period (even if some of the references come after the film’s stated 1987 setting).